North Star Diesel Service helps to keep your equipment on the road with a range of services including oil changes, tire repairs and brake jobs. They also offer both Federal and Minnesota equipment inspections. Located onsite with Transport 21, North Star Diesel is ready with six truck bays in its 6,000-square-foot service area. 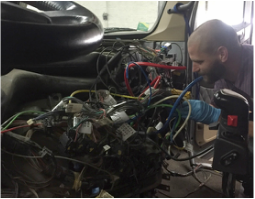 Well trained technicians and staff pride themselves in delivering quality service, at an affordable price, in a timely manner. When you stop, you will find a clean drivers lounge with free coffee and computer use including Internet access and Wi-Fi service. For your traveling comfort, showers, towels, and a full laundry facility are available at no charge. Roseau Diesel Service, located in Roseau, Minnesota, has been in business since 1968. Equipped with three trailer bays and room for 5 tractors, they offer services for oil changes, preventative maintenance (PM), Federal and Minnesota equipment inspections, tire repair, truck & trailer alignments, and engine diagnostics for Cummins and Detroit engines. ​In addition to their mechanical services, Roseau Diesel also towing service available.